We are located .8 miles from Disneyland. Our home has 4 big bedroom, 3 baths, Pool table ,Foosball table and much more. Our Style for this house is Modern. Green grass on front of the house and the house is gated for your comfort with fruit trees too. You can see the fireworks from the pool area. Huge Living room, Beautiful Aquarium, LCD flat screen TV and 3 more TVs around the house. Really Nice neighborhood and save to walk any time.! Our houses are affordable and comfortable. :) Relax , Relax after a long and Fun day at Disneyland! We required 5 minimum stay for major holidays. We are a Hard working Family that love to share our Humble home by Disneyland with families all over the world. Location, Location, Location! This a very spacious home with a great floor plan. We take pride of out property and we want to make you feel like its your own vacation home in Southern California. VRBO # 163431 VRBO # 195264 Let's us help you create great memories. The house floor plan in this house is great. Open space you wil never feel crowded. The pool with waterfalls, Hot tube, Watch the fireworks from the Pool area is very Special. Our personal touch little details makes a big difference. Stay with us and let's build great memories together. Up to four car we are on a corner lot. Pool heated $150 per week at 80 degrees F . Remember is not a hot tub.If you want the pool to be 85F to 95f degrees it is $250 per week. A perfect place for our big family group of ten. Located less than a mile's drive from Disneyland. 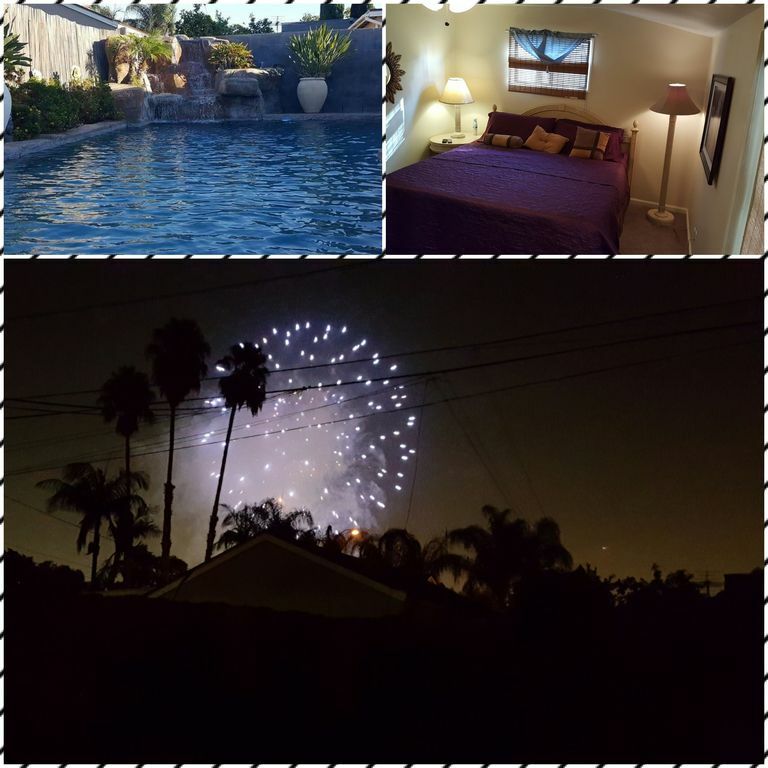 Very well equipped - had everything we needed and more, including a fab pool and view of fireworks every night. The house was a great size for the eleven family members. It was spotlessly clean and available to us on time. When we arrived the inside temperature of the house was 88F. It was uncomfortable warm inside the house for the whole week. The house was well equipped with lots of toys for the little ones. The pool and hot tub was lovely. We enjoyed the fireworks each night. It is unfortunate that the poor air conditioning made it so uncomfortable. It was the best. Everything we needed was there. Plenty of room for everyone and plenty of fun stuff to entertain us when we weren’t at the parks. Really really loved it. I brought my 8 is enough (really it is enough) family to hit Disney and universal. Plenty of room for everyone and the jacuzzi was a welcome dose of relaxation after powering through the parks. I also really appreciated having a full kitchen to cook in, with plenty of pots, pans, forks, knives, and spatulas, When you figure in what you save not eating out every night this gem is a great bargain for families on a budget. We totally enjoyed our stay in your home.We particularly enjoyed the space.When there are nine people sharing this house it was nice to be able to escape.I also appreciated the number of towels you left for us ,this might seem odd but when you have a pool, a hot tub and showers with four teenagers this was important.The house had anything you needed to make you feel at home.Thanks Liz from your Canadian friends. Clean, well-stocked, helpful, perfect distance. This wasn't an excellent house. Easily slept 11 of us and was great distance Fromm our destination. The only bad thing that I experienced was the door code being wrong (1 number off), and the wifi password was case sensitive but was given wrongness. Easily remediable things as the property manager answered our calls immediately and helped out. Great floor plan, wonderful amenities. Would use again. The City of Anaheim have a 3 nights minimum stay . 3 night gaps will ONLY be filled based on availability and may be DISCOUNTED, inquire about the details.